From his son Valintin's baptism record, we know that Michael was a farmer. Michael Skroch was identified as the godfather to Krestek Skuphin. 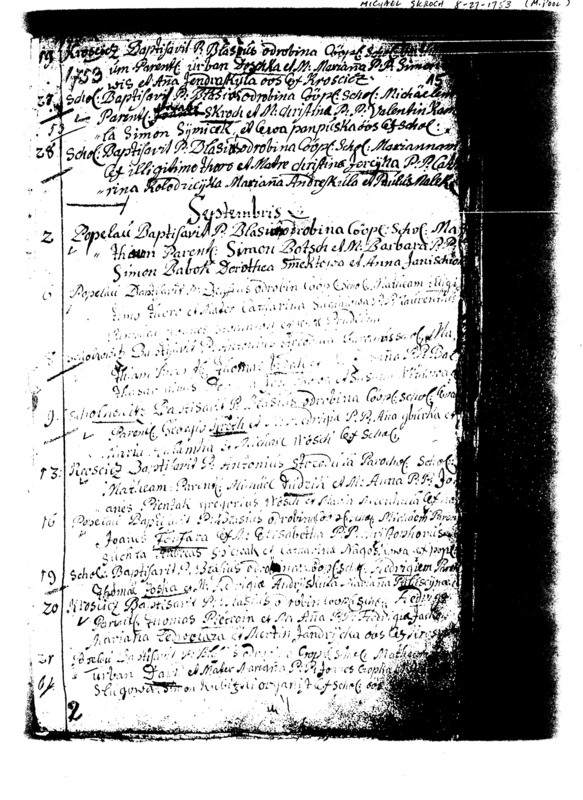 Subject: Michael Skroch - 1753 Baptism - and a break through ... perhaps! Here’s a really exciting find which I believe may connect the Simon line and the Jacob line … and connect those two lines to Thomas Bauch-Mertens’ line as well. 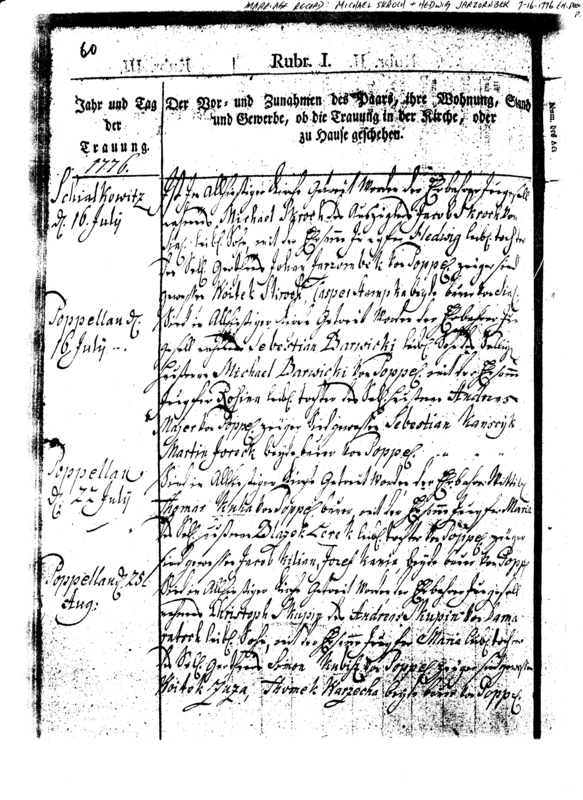 Attached is the baptism record for Michaelem (Michael) Skroch from 1753. I believe this is written in Latin as I’ve noticed that many names have “em” or “um” or “is” or “us” or “ius” added at the end of the names. The baptism record is from August 27, 1753. Now, some of this is open to interpretation as the script is difficult to read so I will leave it up to you to decide if you see the same thing I see. Here, the name of Michael’s father as originally written looks to me like Joannis Skroch. The name Joannis is then crossed out, and what appears to me the name Jacob is written above it. This name is then followed by A M:Christina ( the M being an abbreviation for Matre, or mother in Latin). I’ve added a second attachment to show a close-up of the name so you can decide for yourselves. I don’t think that when dealing with records this old that we can ever be 100% sure of anything, and normally I would want at least two independent sources, but given the limited information we have, I feel that what I’ve presented here is probably correct. I hope you found this as interesting as I did. Ist in allhiesiger Kirche getraut worden der ehrbare Junggeselle namens Michael Skroch des Auszüglers Jacob Skroch von Siol. leibl.Sohn mit der Ehr???? Jungfer Hedwig leibl.Tochter des ??? Gärtners Johan Jarzombek (or Jarzornbek) von Poppel. Zeugen sind gewesen Woitek Skroch, Casper Stampka beide Bauer von Siol. I found Michael Skroch born 27.8.1753 in Siolkowice/Schalkowitz. His father Jacob Skroch is born round 1734. Martin, this Jacob Skroch must be our 5G grandfather !!! !